Abstract Temporal changes in the power of the longwave radiation of the system Earth-atmosphere emitted to space always lag behind changes in the power of absorbed solar radiation due to slow change of its enthalpy. That is why the debit and credit parts of the average annual energy budget of the terrestrial globe with its air and water envelope are practically always in an unbalanced state. From early 90s we observe bicentennial decrease in both the TSI and the portion of its energy absorbed by the Earth. The Earth as a planet will henceforward have negative balance in the energy budget which will result in the temperature drop in approximately 2014. Due to increase of albedo and decrease of the greenhouse gases atmospheric concentration the absorbed portion of solar energy and the influence of the greenhouse effect will additionally decline. The influence of the consecutive chain of feedback effects which can lead to additional drop of temperature will surpass the influence of the TSI decrease. The onset of the deep bicentennial minimum of TSI is expected in 2042±11, that of the 19th Little Ice Age in the past 7500 years – in 2055±11. The question that comes to mind, is this consistent with the data collected by Livingston and Penn, with the sunspots disappearing around 2017. It does not appear to be. Your thoughts are most welcome. somewhere in all that has been written about the coming Glacial Maximum the answers can be found. However it will not be until after the fact that the answer is recognized. It seems that those that recognize the coming conditions are getting part of the answers correct. Timing is the hardest part of the equation. The fact that the overall trend for the last 5+ thousand years has been cooling should have been a clue for the members of the Chicken Little Brigade that are promoting CAGW or CACC. I recently saw a chart of the long term cooling. I will see if I can find it and will post it for everyone’s education. Thanks for the insight. Russ: Anthony glad to hear you and the family are safe. I made the link active. If you look at the plot, the average still follows the known ice age history. It’s just that the new information provides much more detailed weather information. While the cold part of the cycle is bad, the warming section my have allowed human migration and may explain some of the strange information they are getting as to when a population occupied a location. The earth alternates between warm and cool mode with warm mode being about 10,000 years and cool mode about 90,000 years. We are currently near the end of warm mode and about to enter cool mode. It took us about 10,000 years to go from cave man to what we have today and the question remain. How will we cope with a much cooler climate? There is now a second question and that is now we know the temperature can shift in an ice age, when we enter it will it be with a cold spike or a warm spike? If we enter it in the warming cycle, we may have more time to adjust to the climate shift. If you live in North America or northern Europe like I do – it’s not very hard to spot the shapes and geomorphology of a relict glacial landscape, not far from me – it’s all there; roche moutonees, very fresh looking glacial striations, boulder clay, kettle lakes and classic U shaped ice grounded valleys – the only thing missing is the ice. We would not be all here, were it not for the recovery from the most recent ice advance, that’s what it is, an interstial warming between the previous and the next advance – as Anthony says, we are due another ice age and geologically speaking very soon. I don’t think this is inconsistent at all with the Livingston and Penn work. They are even referenced in the PDF. But one thing I don’t understand is where the drop in TSI by 5 Watts comes from. It’s quite an extrapolation from what has been observed so far of less than a tenth of that. You might want to look at this graph. The lean 2000 graph shows a change of 3 Wm^2 but she was ‘leaned on’ since TSI is not supposed to be a factor in climate according to the IPCC. Judith Lean was then rewarded with the top reviewer spot and her paper spottlighted in AR4 2007. On Judithgate and the behind the scenes story. 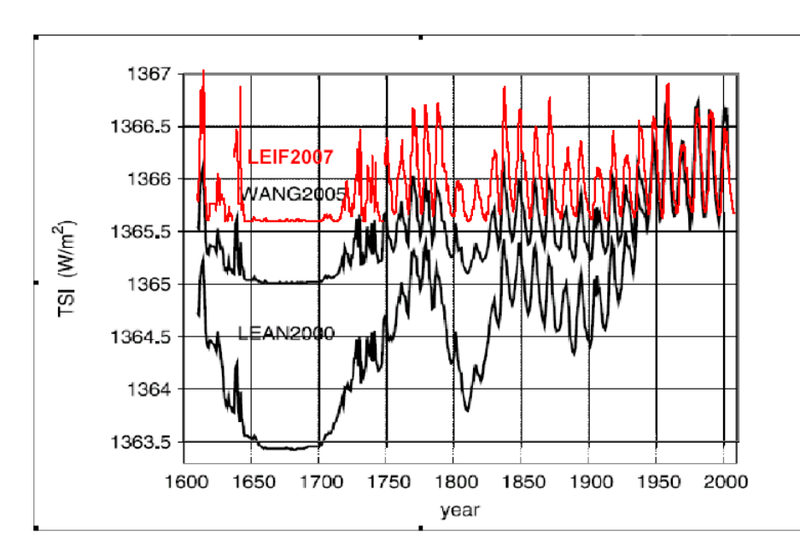 Leif Svagaard referenced a new paper on the onset of the Maunder minimum over at Solar Cycle 24: http://arxiv.org/pdf/1103.1520v1.pdf. The new examination of the data indicates a gradual onset which would be similar to the prediction by Abdussamatov in this paper with a transition over 3 cycles. Thanks for the link. I am going to read the PDF in detail and will report back. We could be in for interesting times because excessive cold is a lot harder to deal with thab a little bit of warmth! I cannot find way to turn off that feature from my end. I will sent a request to wordpress to see if they have some suggestions. Sorry about the inconvenience! There seems to be a tendency to proclaim a single cause for changes in the climate. It is a chaotic system of chaotic systems so sometimes an input even a large input at the wrong time will have no effect whereas the same input at just the right time could move the climate system to a different attractor. This is rather like timing the ankle throw just right. So the Earth has its own innate chaotic systems with emergent patterns that sometimes may be in synchrony and sometimes not. The Sun would appear to have chaotic patterns some of which may be driven by the planets whose orbits are also to some extent chaotic. External to the Solar system are events such as supernovae which may shower the Earth with GCR. In many cases the possibility of achieving the perfect ‘ankle throw’ is never available as the relative positions of the other systems in their orbits around the various attractors does not allow it. But every now and then an opportunity arises with a conjunction of several of the systems. It may be that we are approaching just such a time. I won’t be moving to Northern Canada.and selling my coat. Hello everyone. I find this thread very interesting; especially the level intelligence that is evident in the responses. With that I can’t add any new science because the most important points have been made. I would like to add some perspective however, like every algorithm there are known and unknown variables, as well as constants. In our case here, there are many variables and a couple constants; most of which do not affect the outcome as much as the two most important variables. The amount of energy our Sun adds to the Earth and the amount of Ocean that can effectively absorb that energy and retain it. Heat loss on land (practically overnight in the sandy regions of the world) make land mass a minimal factor. So the World’s land masses being covered by snow/or not, is relatively negligible (long term). Considering that the ambient air temperature around the world is just that, ambient, it too is rather negligible (long term) when considering long term climate patterns. This brings me back to my initial point, the Sun and Oceans are the predominant factors in controlling Earth’s climate (long term). How much energy the Sun adds to the equations as a factor of how much energy the Earth’s Oceans can absorb. Everything else is minimal (long term, even we are just a spot on a timeline historically). We can talk about how carbon dioxide can warm our planet through infrared dispersal of energy, however carbon dioxide is heavy which means that it will eventually find its way back down to the lowest surfaces of the Earth; namely the Oceans (needless to say this is why when checking for carbon dioxide some very intelligent scientists decided to examine that phenomenon over the pacific ocean). Since water can absorb carbon dioxide readily (as well as disperse it), the Ocean’s again control the amount and the affect that carbon dioxide has on our planets temperature. I might even add that the idea that carbon dioxide is a green house gas is controlled by properties that the carbon dioxide is covering. If covering city scape or snow, carbon dioxide would indeed have an extremely large effect in infrared dispersal of energy (hence the reasons for so much ice melt at the poles). However, if carbon dioxide is covering a substrate that has an larger energy absorption property, such as unfrozen ocean, the effect would be considerably altered because considerably less energy is reflected back to the carbon dioxide in atmosphere. But again, at the end of the day carbon dioxide right now is still pretty minimal in the warmth of the Earth equation. What is more important is the Ocean’s and Solar Energy.